The little Thérèse, that of the Child Jesus (1873-1897), a daughter of the Great Teresa, of Jesus, is honored today by the Church. In the right perspective, both women of the Carmelite order, Thérèse and Teresa, are magnificent witnesses to another way of living the Gospel of Jesus Christ and the teachings of the Church. Liturgically, we have Avila’s feast on October 15. If we understand nothing more today, know that it was the Lord who was Thérèse’s certainty, He alone her guide (cf. the entrance antiphon). The Mass Collect identifies the central focus of Saint Thérèse: a little way. What is the little way? The little way taught by Saint Thérèse is see one’s life from a perspective of humility, that of a child (cf. Mt 18:3), that the force of love becomes a reality; the language and method of the little way is that of love, of mercy. The Catholic Information Service (Knights of Columbus) publishes a handy booklet that you can order, or you read it as a .pdf, “The First Steps on the Little Way of Saint Thérèse Lisieux.” I can’t recommend this text enough! 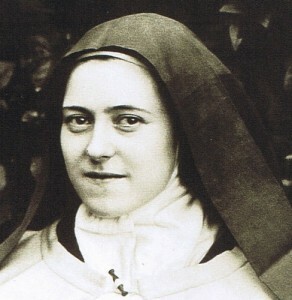 Saint Thérèse, a child of the Martin family which was quite devoted: several sisters entered religious life, her parents are on the road to sainthood. She was educated by the Benedictines before entering the Carmelite. Saint Thérèse’s autobiography, The Story of a Soul, I find a compelling narrative of going deeper but that’s only after dealing with my prejudice of seeing the autobiography as saccharine; the depth contained therein is remarkable. Saint Thérèse Lisieux is one of the the patron saints (with Saint Francis of Xavier) of the missions. John Paul declared her a Doctor of the Church. Let’s pray for missionaries and for a deeper understanding of Thérèse’s little way.